With a style that young artists identify with, these spiral-bound sketch and drawing pads contain a better-quality, 45 lb paper than entry-level sketch and drawing pads. 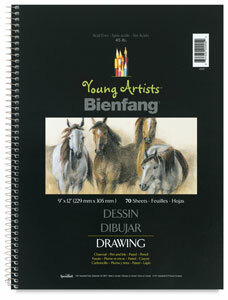 Excellent with pen and ink, pastels, and charcoal, the medium-texture surface is also very good for use with pencils. With a style that young artists identify with, these spiral-bound sketch and drawing pads from Bienfang contain a better-quality, 45 lb paper than entry-level sketch and drawing pads. Excellent with pen and ink, pastels, and charcoal, the medium-texture surface is also very good for use with pencils. Acid-free. ® Bienfang is a registered trademark.™ Young Artists is a trademark.